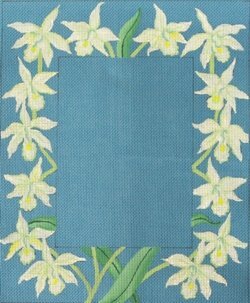 This beautiful frame of white orchids with a blue background is perfect for any new couple. It is offered by JulieMar & Friends. The design measures 9" x 11"; the opening is 5" x 7". The Orchid on china blue frame is on 18 mesh mono canvas. The frame comes with or without threads. If you choose cotton we will provide DMC floss; for wool we use Bella Lusso; and for silk we use Pepper Pot fibers which are single stranded. If you want to keep your canvas taut we recommend a pair of 13" and a pair of 15" stretcher bars and some thumb tacks. The frame is usually in stock. If you need to know about availability, just contact us.